In today's multicultural society, learning a second language is a must. I have been looking for a program that is ideal for helping my children learn Spanish. 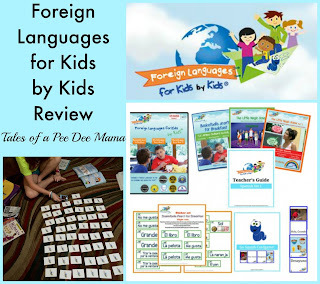 I was excited to review Starter Set 1 from Foreign Languages for Kids by Kids with Little Red. Teacher's Guides for Levels 1-3 - Each guide is a soft-cover book between 15-23 pages. I'll share more about these in a little bit. Student Workbooks for Levels 1-3 - These are full-color, soft-covered books, one for each level. I'll share more about these as well in a bit. Sticker Set - 9 pages of stickers to put around the house to help remember the vocabulary. Flashcards - A set of vocabulary and graphics for each of the first 3 levels. 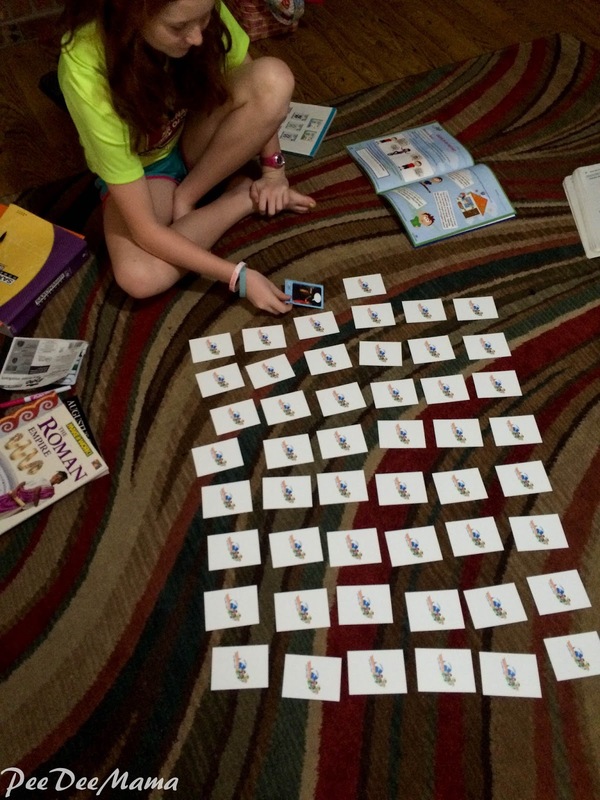 Go Squish Card Game - This soft-cover rule book explains how to use the flashcards to play a game that is similar to Go Fish. Little Red and I have enjoyed using Foreign Languages for Kids by Kids. The videos are completely in Spanish so we had to learn by immersion. When I first saw that the entire video would be in Spanish, I was a little concerned that it would be too difficult for Little Red (and for me - ha!) There was no reason for my concern, though; these videos have a very gentle approach and the story line is very easy to follow which makes learning the vocabulary quick and simple. At the end of each video is a Rapid Review. Images from the story are shown on the screen with a short delay before the Spanish vocabulary word appears on the screen. Little Red loves to try to beat the word appearing on the screen, calling out the Spanish herself. It's become quite a family event because the other kids (even the 16 year old) will come in while we're watching the video and then participate in the Rapid Review. I told you I would get back to a description of the Teacher Guides. The first 3 pages of the first level guide were extremely beneficial. They give a detailed description of how to get started, including an overview of the program, the goals of the program, and a list of important hints and tips for using the teacher's guide. The guides are broken down into lessons. For the first video, Basketballs Aren't For Breakfast, there are eleven lessons. Over the first few lessons, we watched the video several times. The first day you watch the first 5 minutes; day 2, the first 8; day 3, the entire 12 minutes; day 4, the entire video again. As you can see, the videos aren't very long, and there is a lot of repetition. I know that by repeatedly watching the videos, Little Red became very familiar with the vocabulary. In addition to telling you how much of the video to watch each lesson, the teacher guide also has additional activities to help learn the material, assigns workbook pages for each lesson, and lists the Spanish words and phrases with the English translation. The workbooks are very visually captivating. The images are in full color, and there are a lot of different types of activities to practice the vocabulary learned in the video. There are matching exercises, word searches, secret codes, and word scrambles among others. The workbooks also introduce new concepts. In the Basketballs Aren't For Breakfast workbook, Little Red learned about the articles (el, la, los, las), idioms, the country of Peru, and the use of the accent mark in Spanish words. 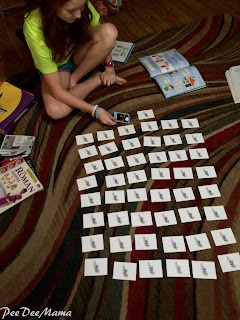 We had a ton of fun with the flashcards. In addition to the Go Squish game, we used them to play concentration - matching the images to the correct word or phrase. A couple of her sisters joined her to play this. It was amazing how fast they had all picked up the vocabulary just through watching the videos. (Little Red was the only one who did the workbook activities.) 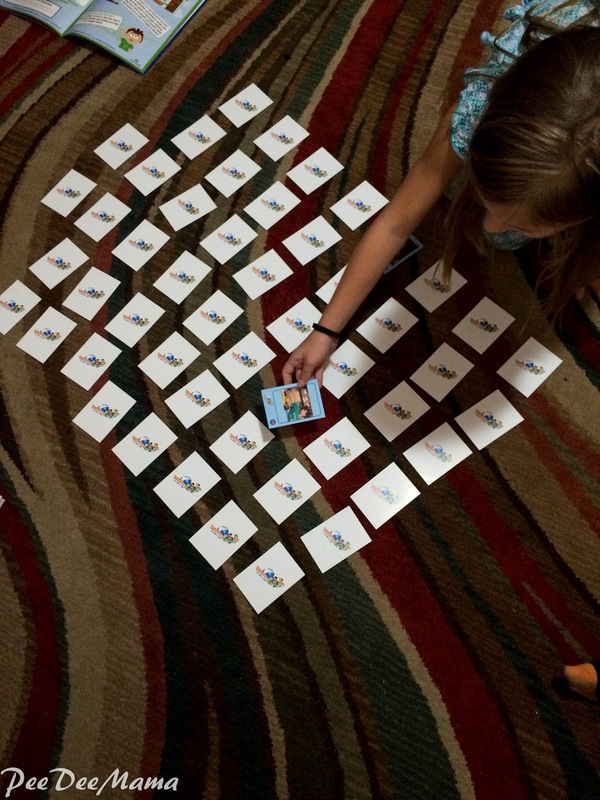 We also used them to do a rapid review type activity, where I held up the picture and she yelled out the Spanish word. 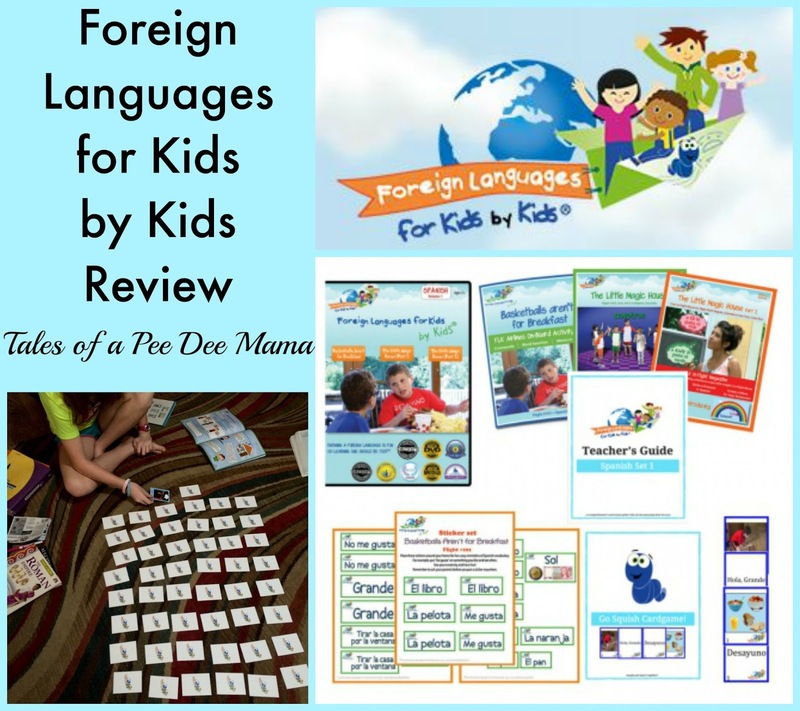 Are you interested in what others have to say about Foreign Languages for Kids by Kids? Check out more reviews from the Schoolhouse Review Crew.